American diets are undergoing a positive change, and gluten-free options are popular. 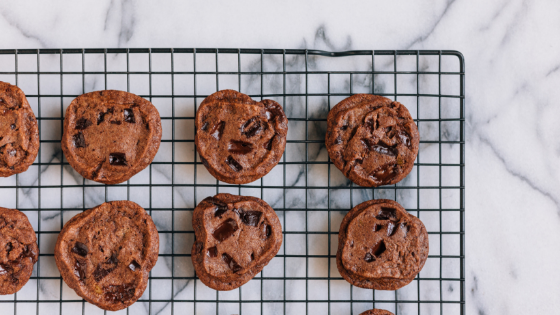 We hope our Citizen at Shirlington Village community members in Arlington, Virginia, enjoy these gluten-free cookie recipes. When you line up the four Cs of treat delights, there’s no possibility of resisting. Create a gluten-free option, and that’s just a bonus. Whisk the flour, xanthan, salt, and baking soda together in a mixing bowl. Add in the melted butter, cream cheese, and mix at medium speed until blended. Add the egg yolks, vanilla, brown sugar, and granulated sugar. Continue mixing. Once thoroughly combined, pour in the chocolate chips and mix by hand. Cover and refrigerate for about five hours. Remove from the refrigerator and leave at room temperature for 45 minutes. Preheat an oven to 375 degrees. Line two cookie sheets with non-stick parchment paper. The dough can be scooped into about 20 equal mounds, about 10 per sheet and evenly spaced out. Bake for 12 minutes or until the edges begin to brown. Don’t worry that the middle appears undercooked. They will set up while remaining on the cookie sheets at room temperature. Ranked among the more healthy cookie options, people on gluten-free and vegan diets are likely to embrace this recipe. Preheat the oven to 350 degrees. Blend the flaxseed and coffee in a cup. In a bowl, mix all the other ingredients thoroughly. Then, add in the now-thickened blend in the cup and mix thoroughly. Line a cookie sheet with non-sticking baking paper. Scoop eight mounds and bake for up to 15 minutes. Let cool and enjoy. We hope our Citizen at Shirlington Village community members enjoy gluten-free recipes. If you or a friend would like more information about our Arlington, VA apartments, call us today.